Fellowship training involves clinical (out-patients, in-patients and critical care patients) and research training. Upon completion of fellowship, satisfactory marks on a written and an oral board examination are required to be conferred the status of “Diplomate” in Endocrinology. 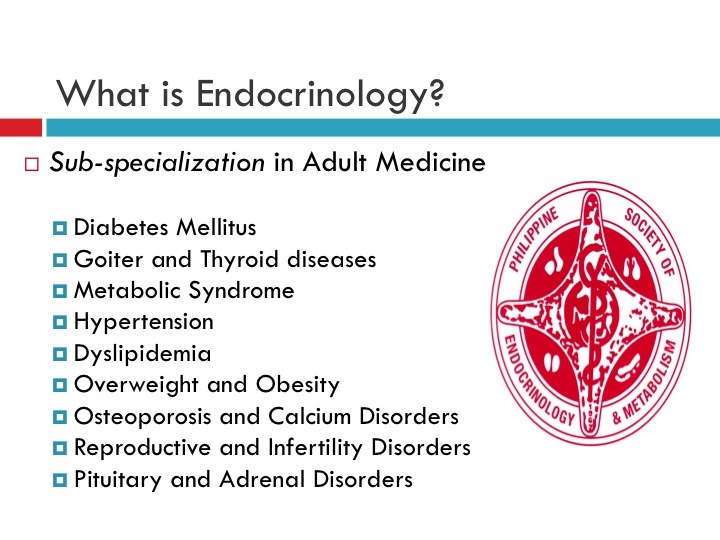 Unusual diseases of the adrenal/pituitary/parathyroid glands, metabolic bone diseases such as post-menopausal osteoporosis and complicated cases of thyroid disorders and diabetes are best handled by an Endocrinologist. This entry was posted in Patient Education (Para sa Pasyente) by hannahpotmd. Bookmark the permalink.